It’s spring! The sun is shining, the birds are chirping and it’s finally time to come out of our winter hibernation! April is just around the corner so it’s a great time to start planning your celebration ideas for these April Bizarre Holidays. These are great reasons to celebrate within your mom & baby group or with your family. There are so many fun & bizarre holidays to choose from but here are a few that are perfect for family fun. Which ones will you be celebrating? 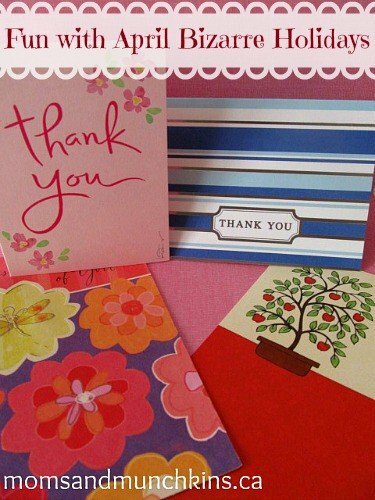 National Card & Letter Writing Month: This is a great craft opportunity for a play date. Supply plenty of construction paper, thick paper, stickers, markers and quotes (can buy these as scratch on decals) and have children create a special card for someone special. National Kite Month: Take the children out for a special day in the park for flying kites. Even young ones that aren’t able to fly kites on their own yet will still enjoy watching others fly kites in the sky. Physical Wellness Month: A great time to get active and teach your kids about the importance of physical activity. Try arranging for a Mommy & Me sample fitness class for your play group. National Library Week (April 8th – 14): Visit the library and have a fun scavenger hunt with the kids. Here’s a library scavenger hunt page that you can print for free. National Farm Animals Day (April 10th): A great day to visit a local petting zoo with the kids! You could also make special farm animal cupcakes like these ones from Betty Crocker. National Park Week (April 21 – 29): Visit a local park and try one of these park activities for kids. Stay updated on the latest ideas for silly family fun by following us on Facebook, Twitter, Pinterest and Bloglovin’.